Mr Shiundu holds a Bsc. degree in Naval Architecture and Shipbuilding and an MSc. degree in Maritime Safety Administration. He is an alumnus of the Ashridge Business School, UK and has also attended many manage ment and Leadership development courses. Prior to joining IMO in 1997, Mr Shiundu was the General Manager of African Marine and General Engineering Company Limited, the largest Shipyard on the East African Coast. He previously worked for Kenya Ports Authority as Assistant Merchant Shipping Superintendent. Between 1990 and 1996, he was also a registered consultant in the maritime sector to a number of UN agencies as well as the World Bank. He has worked closely with the Ministries responsible for Transport, the Port Management Associations and related regional organizations in Africa and is credited with the general improvement of the maritime sector in Africa towards meeting international standards and requirements. He actively participated in all the preparatory meetings leading to Rio+20 as well as in the main Conference on Sustainable Development held in Rio de Jenairo in June 2012. Mr Shiundu has over 25 years international and diplomatic experiences in all aspects of the maritime sector as well as in managing and implementing change and development cooperation programmes in the commercial and public sectors. He formulated the concept paper and action plan for the Lamu Port and South Sudan Ethiopia Transport (LAPSSET) Corridor project, a US$26 billion infrastructure project. Mr Shiundu has authored and contributed to many articles and publications, and resourced at several international conferences and seminars. He has also appeared as a key Expert Witness to a number of judicial Inquiries involving maritime accidents. 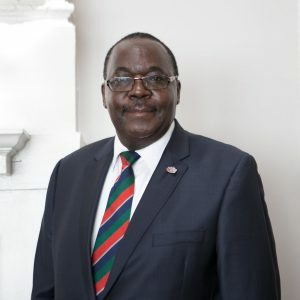 He is a Trustee of the Apostleship of the Sea (Great Britain), member of the Honourable Company of Master Mariners, Deputy Chairman of The Kenya Society (UK), and a member of other professional institutions in the maritime sector.